I made the below poll because many new translators applying to my translation agency were asking what they should charge. I drew the rates data from my database of more than 15,000 translators who had already applied (until Sept. 4 2014), the remaining data submitted to this poll directly from this website (since May of 2009). Note that rates charged to direct customers are generally higher than fees charged to translation companies. The % is a wild card, so chin% would yield both “chinese mandarin” and “chinese traditional”. Here is some more info and tips on translator fees, charges and rates in general (where this poll was originally posted), as well links to other sites that offer similar information. Here you may add your own rate to the poll. This entry was posted in Translation Tips and tagged charges, fees, poll, rates, translator on September 4, 2014 by madmin. just received the following response from the translator. Perhaps your customer should not have been so demanding and not tried to whittle down the price. Slovenian translators are generally not cheap, located next to Austria, and I have very few Slovenian translators. Not to mention the time zone difference. I’ve just checked my email. Honestly, I think it is better if you give this to another translator. a) I cannot make the text read fluently as these are balance sheets, I can translate individual terms and entries, but cannot make a summary of it as I do not know accounting. b) putting everything into another doc also includes quite a bit of DTP, also I would need to recheck all the terms, so for me it’s quite a bit of work, maybe a different translator would either have less work with it or would be willing to do it for a lower price. below is the translators final response, so I hope everything will be okay. 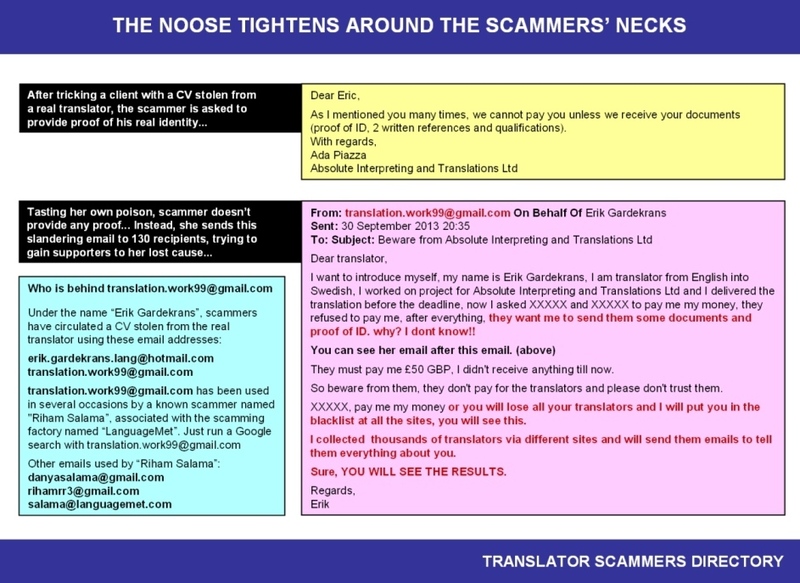 I would just like to say it is generally not good for your client to threaten non-payment, because it can easily scare away a translator, which is not good when there is such a tight deadline and so few translators to choose from. Considering the circumstances, I hope your client will not be unreasonable. I will proofread it as well. Ok. I will do my best to deliver it at least by 2pm GMT tomorrow so that I am still available for potential clarifications for a few hours. below is the customer’s latest response. I believe if you are careful and then I proofread it after you, the final outcome will be sufficiently high quality, but I will leave the decision up to you. But I will need to receive the translation by about 5pm Thursday GMT time in order to have time to proofread it. I told them that they should have mentioned these quality conditions at the beginning. I’ve already spent enough time bouncing these emails back and forth and it would be nice to earn some money from it. I believe she didn’t start because of the clients stringent requirements stated at the very end of yesterday, so I guess it scared her a bit. I have proofread her work once before and it was overall good, but she is not native English, so it certainly is not perfect. Even after I proofread it, it may have a slight foreign feel. I do not think it was good for your client to impose these conditions at the very end of the day and it should have been brought up earlier, considering the time zone difference. This entry was posted in Discussions and tagged How to deal with, translation, translator, unreasonable customer on July 24, 2014 by madmin. Sometime around 2012 I noticed a massive spike in my daily emails from translators applying to work for my translation agency, from about 4-10 to 30-50 or more a day. I diligently responded to each email, but eventually determined that these new additions were not from real translators. Below you will find information on the source of these emails and what you can do to protect yourself. 1) What is the source of these fake email applications. 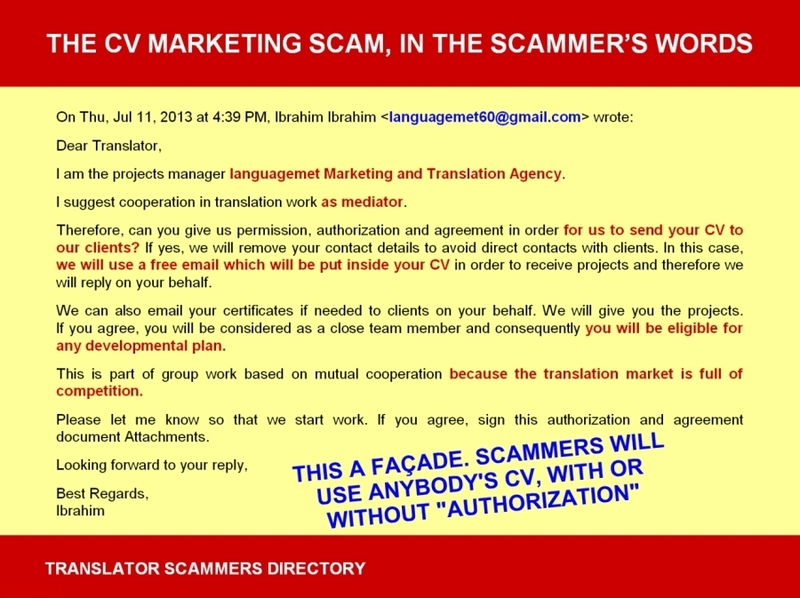 The fake applications come from at least one company masquerading itself as a translation agency but which collects resumes of real translators from the internet and sends emails in their name using newly created gmail, hotmail or yahoo email addresses (sometimes outlook.com or outlook.sa). 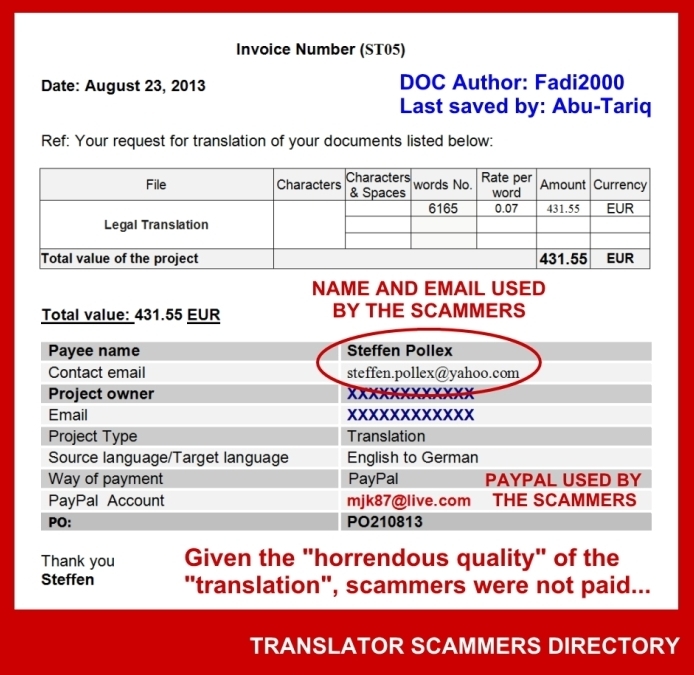 If you try to give work to any of these fake translators, you can expect to receive a poor quality, google/machine translation. 2) What measures you can take to protect yourself. You can set up a free filter to block out existing and known fake applicants, or use our filter system to block out existing and new ones, since the scammer companies are creating new accounts on a constant basis. 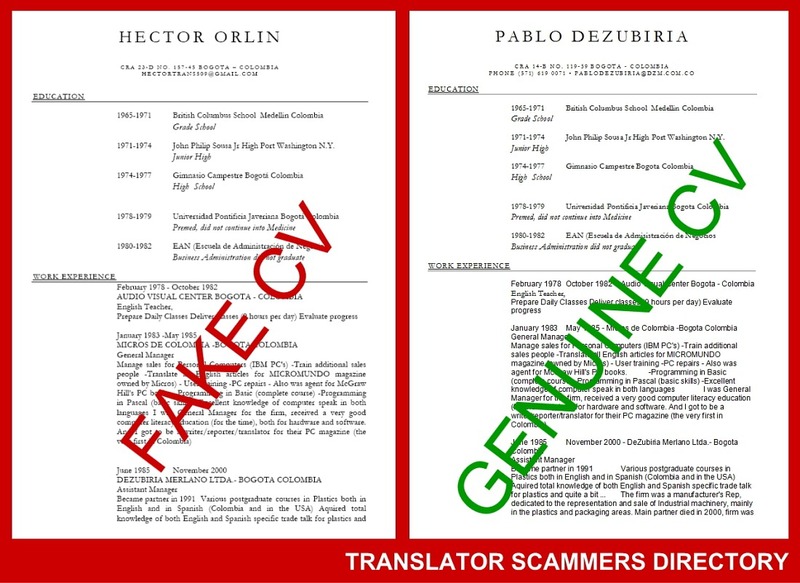 Not only are these fake applications a headache, but they make it more difficult for real translators to enter the industry and for us to accept new ones. 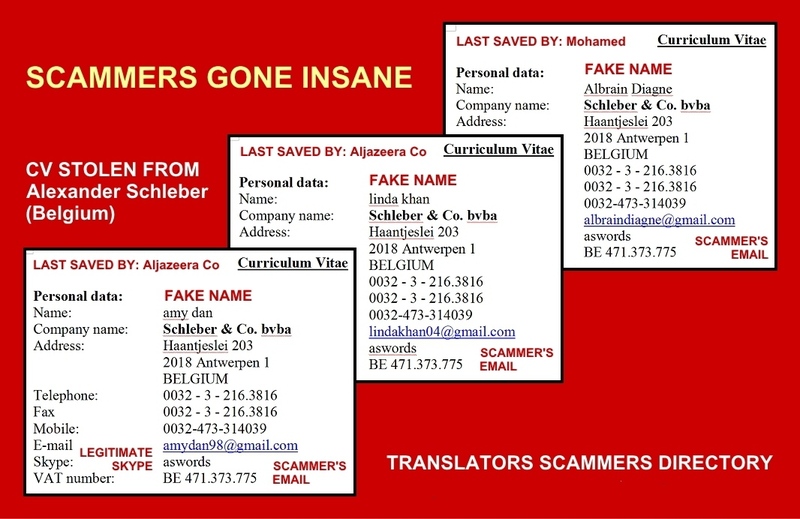 To expose these email addresses to spam, you may find them posted below. 3) CVs sent through this service, about three a month, use a particular template (although custom is also possible) whose subject always begins with a special code to instruct the 15,000+ recipients that they are from real translators. 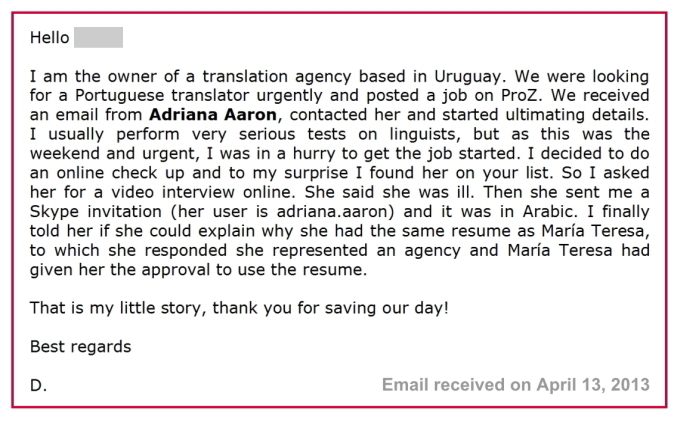 Read some testimonials to see that this is truly an effective way how to expand your translation client base. Below is some correspondence concerning this matter and which may shed further light on it. I just came across your website. I am getting quite bombarded with these translator CVs. Have you tried discussing this with such organizations as spamcop? A lot of email services base their spam filters on this database. How do you confirm that the email addresses are actually spammers? If this process could be expedited we could nip them in the bud. If they are using their own servers to send out all these emails, as I doubt gmail etc would allow so much messages, their IP address could also be marked as a spammer, and save all of our inboxes in the process. Or gmail etc could close down those email accounts. And, what could spamcop (or any other organization) do? Please send me those CVs for proper exposure. If you could check if they are already in my Directory, that would expedite the posting of their data. A lot of email services base their spam filters on this database. How do you confirm that the email addresses are actually spammers? 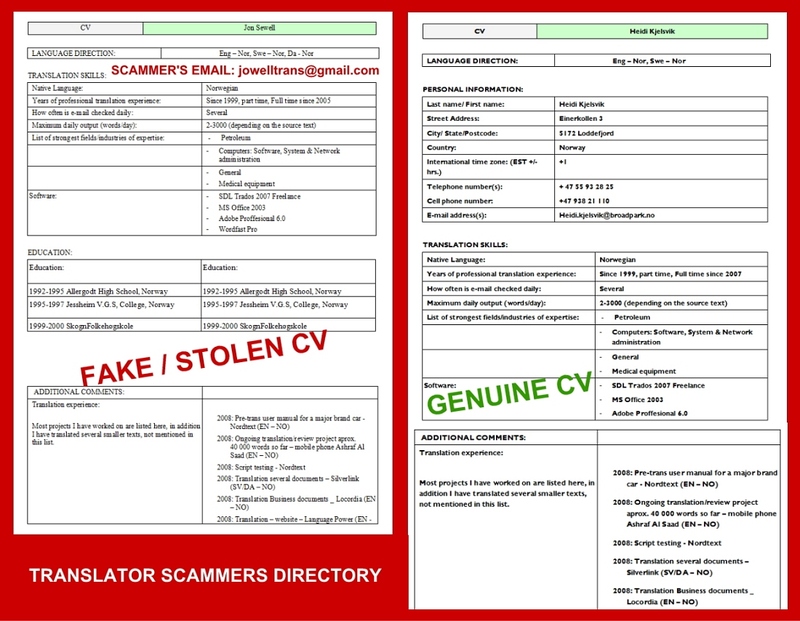 All these scammers emails are posted on hijacked CVs. If this process could be expedited we could nip them in the bud. If they are using their own servers to send out all these emails, as I doubt gmail etc would allow so much messages, their IP address could also be marked as spammer, and save all of our inboxes in the process. Gmail addresses always locate back to Google IP addresses. Or gmail etc could close down those email accounts. Then what? It takes 3 minutes to scam someone’s CV and open another Gmail address. This sort of activity can only be prevented (on the translators/companies side) by a proper risk management attitude. 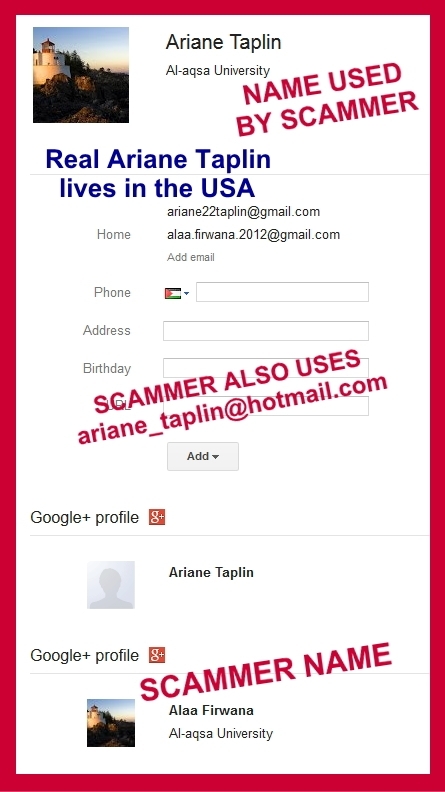 And by exposing scammers IDs and emails used. They live off people not being aware of their operation. The more they are exposed, the less chance they’ll have to continue their scamming operation in the open. 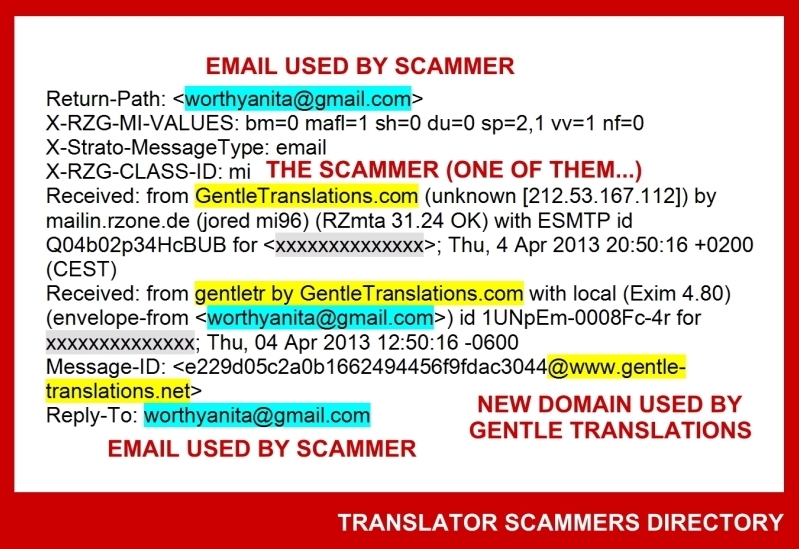 If spamcop and others cooperated they could blacklist these email addresses. That means that any future mailouts from their addresses would end in the spambox of recipients. If google cooperated they could close down the accounts. Or they could go a step further by preventing those people from creating new accounts, but I guess the spammers could just makeup another IP address. But if their outgoing mail ended in the recipient’s spambox, or better their accounts were cancelled by gmail, they’d have to start all over again, for it is usually a timely process to get work from an agency (application forms to fill in, email correspondence and so on). I also probably have the list they are sending to (about 16,000 email addresses), so I can send them an email, such as to inform them they should carefully consider giving work to anyone whose email ended in their spambox (at least check more). More below. Really, I do not expect any cooperation from Google or any other organization. Really. One of the purposes of having these emails in the open is to make them available to spambots. 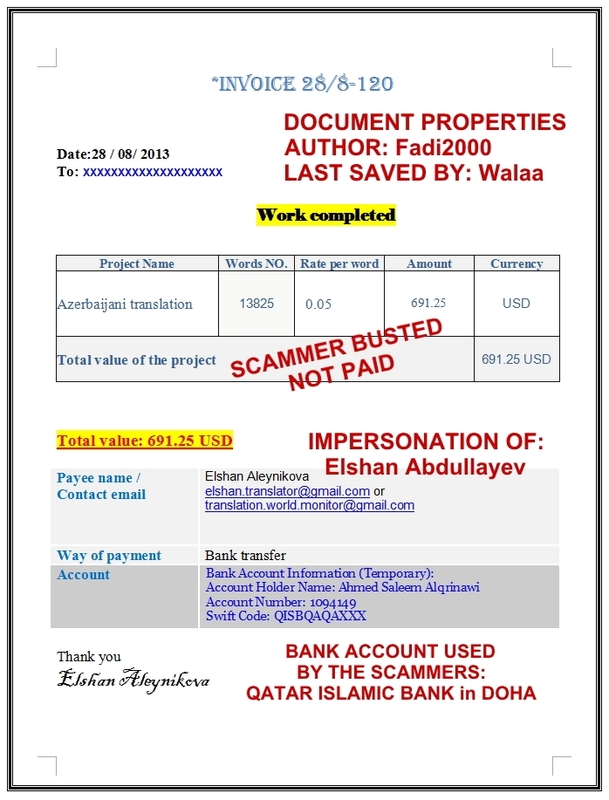 I even publish a TXT file with other addresses used by scammers. I do not know which ones are the spammers. How do you find that out before adding an address to your dbase? 1. Gmail / Hotmail address (a good indication is to have an email from Hotmail that was actually sent by a Gmail address, look at the email header). 3. 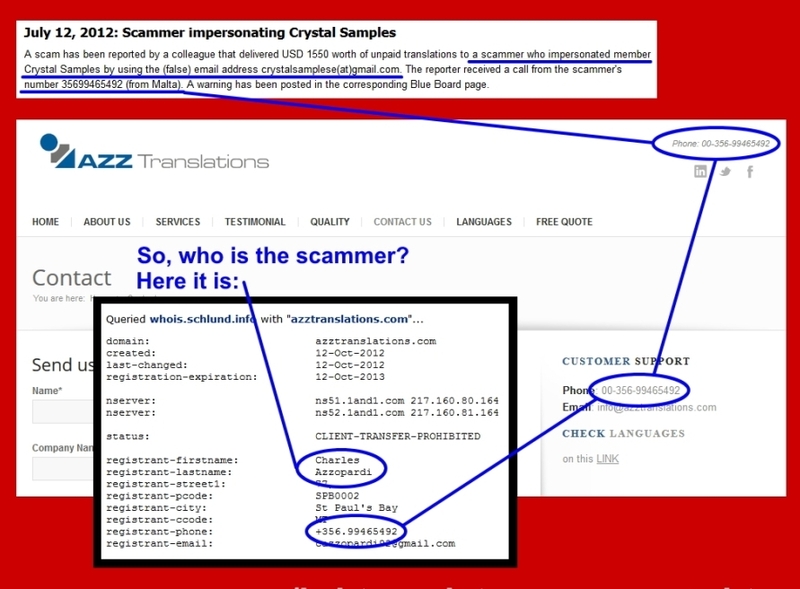 DOC authored/saved by someone different from the scammer’s name… Look at some of the most common names used by scammers in my Directory. Or by having Arabic words in the File properties, in CVs not belonging to Arabic translators. 2. Funny CVs: Italian name, female, born in France, educated in Cameroon, worked as a “removal man”??? 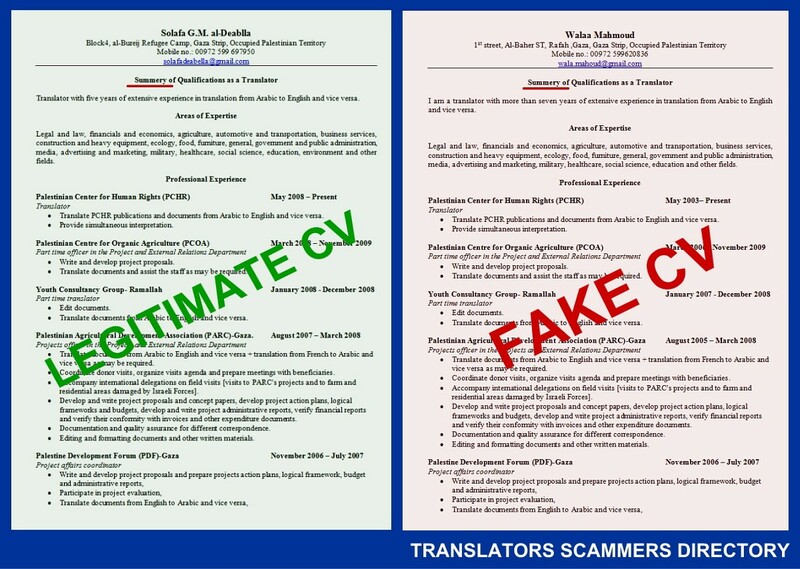 Would you believe it that a translation company in the USA has been tricked by a CV like that? I don’t believe there is a solution, or a silver bullet for this. Exposure, awareness and, above all, good risk management from translators and companies. To help with the cause I am posting the email addresses found on this site below. 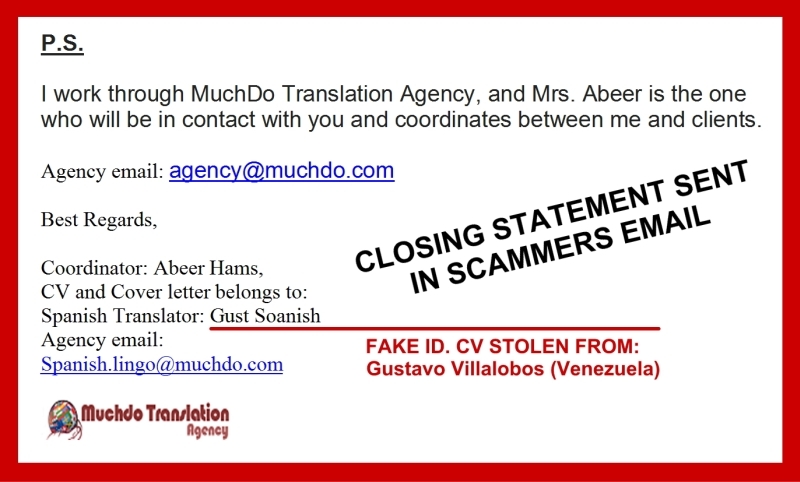 Abeer Majed [email protected] CV THEFT Note 6 Olive Brahn ??? Amanda Solomon [email protected] “Portuguese” translator w/ a Saudi Arabia email? Basel Nahal [email protected] Nationality: Palestinian. Mother tongue: Japanese!!! 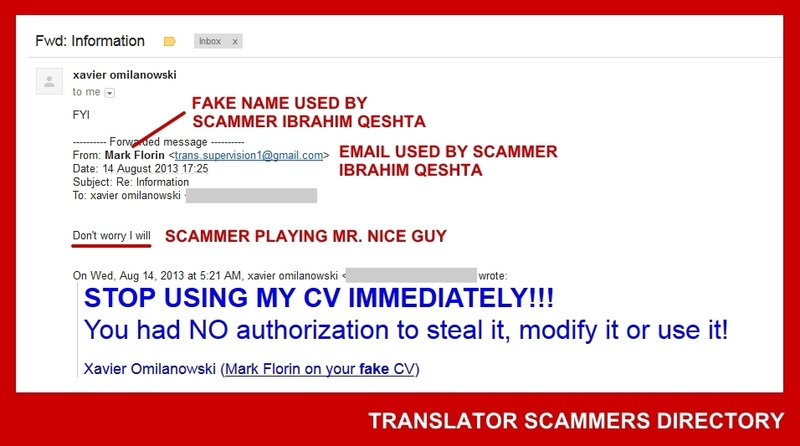 Björn Dahlborn [email protected] Björn Dahlborn (SE) CV scammed w/ photo. 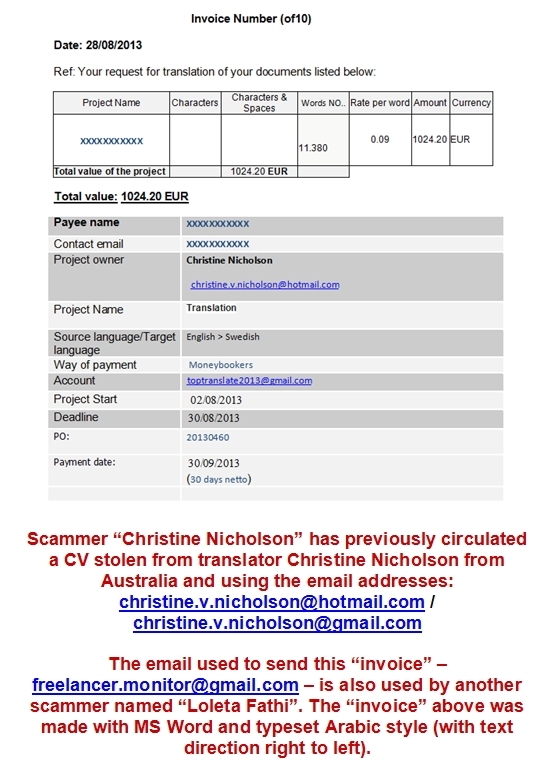 Carlene Wirobski [email protected] Carola Schomburg (DE) Note 16 See her invoice! Danial Walsh [email protected] A Portuguese named “Danial”? Really? 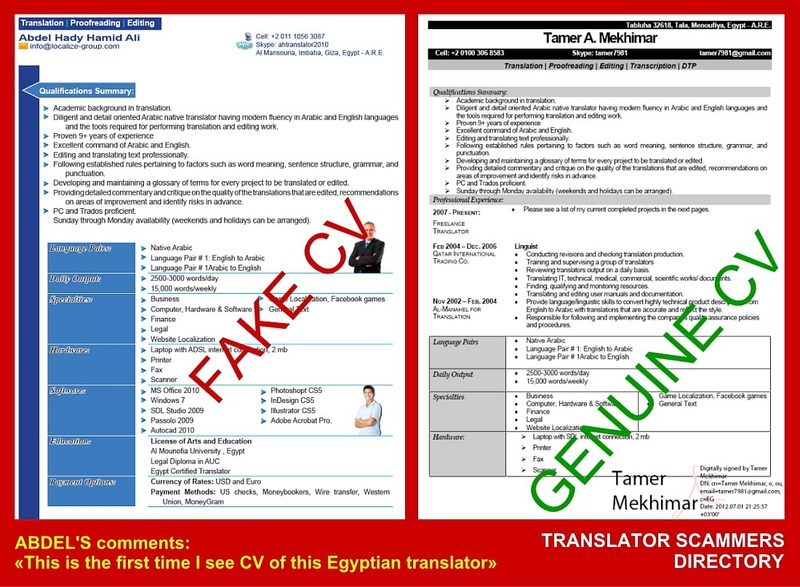 Elfi Griselda [email protected] CV typeset Arabic style (right to left)? Gagandeep Kaur [email protected] Jacqueline Chevardiere (US) / UN certified??? 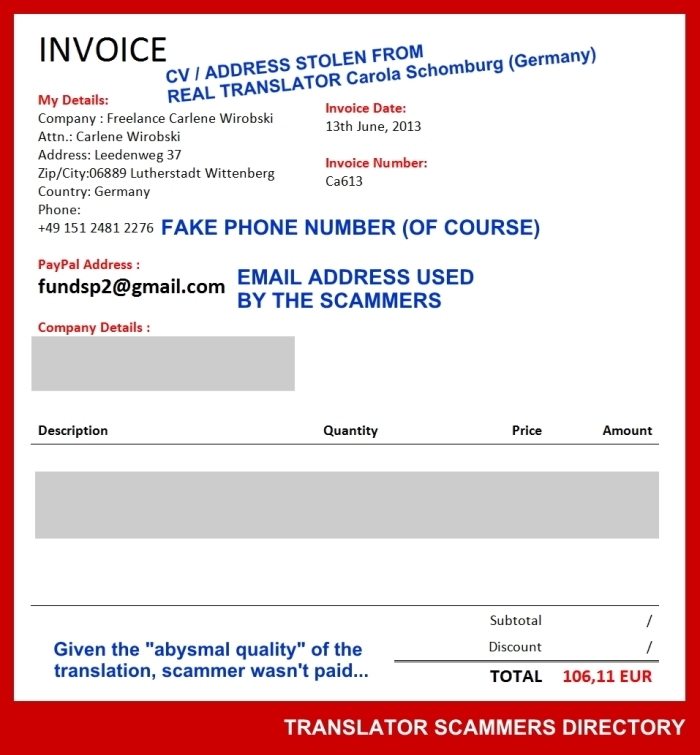 Gim Gavrlin [email protected] Alexander Schleber (BE) 8th impersonation!!! Heleina Ramos [email protected] Helena Ramos (PT) “Heleina / Heliena”??? Henk Haan [email protected] Natasja Hagemeier (NL) A female w/ a male name! 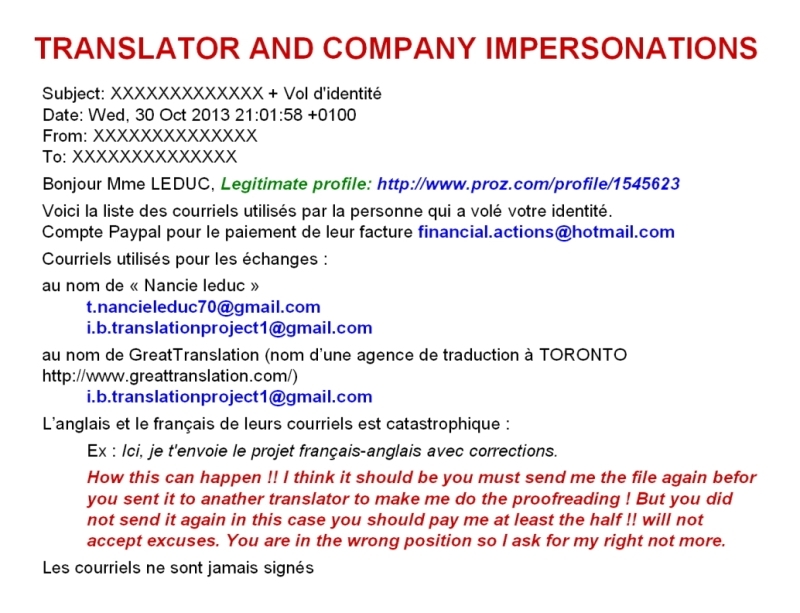 Honest Translator [email protected] “We are translation company” Really? Imad Almaghary [email protected] Notice the double “t” in the domain name? Inna Somers [email protected] Inna Somers (PL) “Author”: Yusuf. 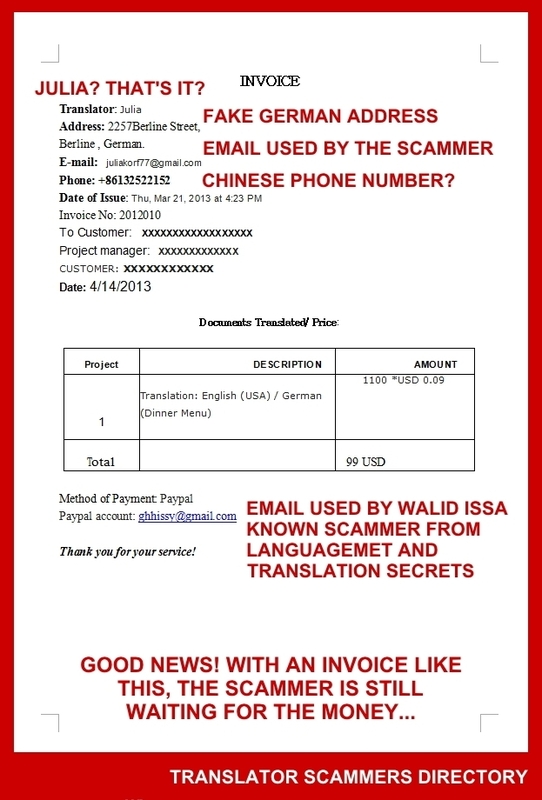 Ismail Ahmed [email protected] “Click Translation Agency”? Really? Jean Sim [email protected] Jean Sim (CA) 9 DIFFERENT EMAILS USED SO FAR! Jenny Shwang [email protected] Ghost If created by scammers. CV available online. John ? 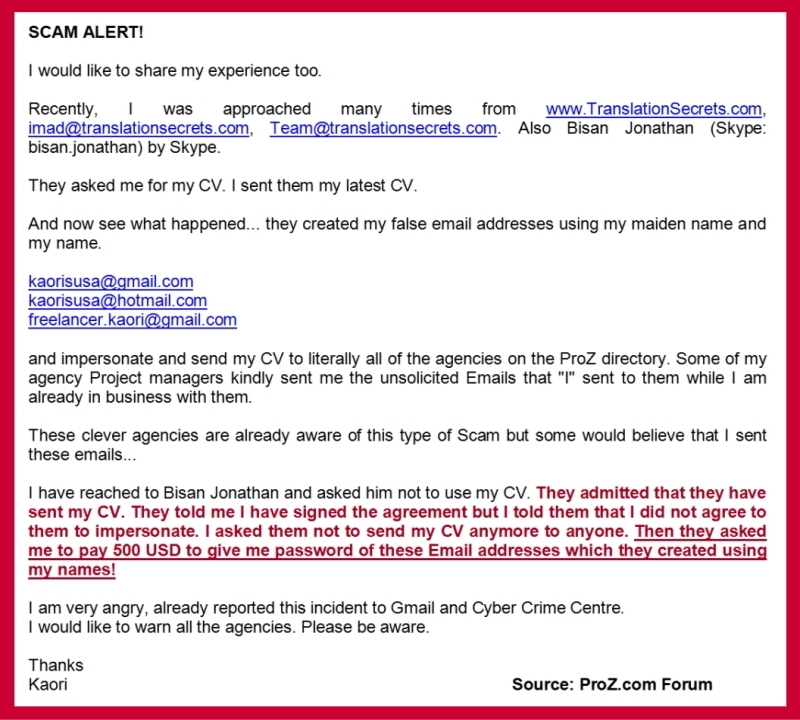 [email protected] Fake ID created by Charles Azzopardi? Jolie Sam [email protected] Ghost ID created by scammers. Also a PayPal ID. Kana Pestana [email protected] Kana Tsumoto (JP) &OS Portuguese mother tongue? Kaori Myatt [email protected] Kaori Myatt (FR) See what happened. 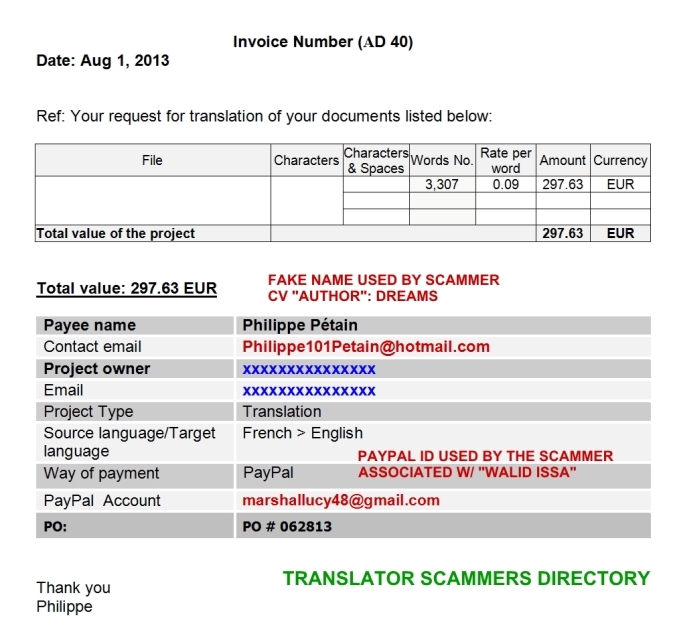 Krwhi Tepayoal [email protected] Ghost ID created by scammers. Also PayPal ID. Lee Yee [email protected] Lee Soong Yee (MY), including photo! 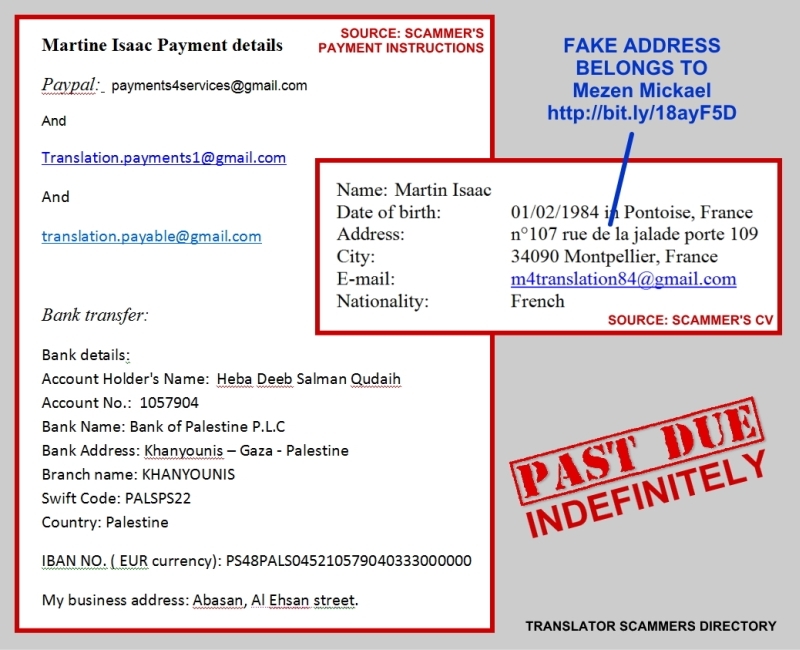 Mamdouh Hassan [email protected] “Mother Tongue International” REALLY? Martha Fernandez [email protected] Jaquelina Misiura Sánchez (UY) Nice email!!! Monika Robert [email protected].com Monika Robert (FR) Yes, again. Nick Michael [email protected] Mother language: Italian??? Olivia Lonzo [email protected] Address: a Hotel in Alicante, Spain??? Pasco Lopez [email protected] Nica Paixão (PT) Nice Portuguese name: Pasco!!! Philippe Pétain [email protected] “Author”: Dreams And, who is this Pétain? Robert Frogost [email protected] Address: “Atlanta Medical Center, Georgia” ??? Romm C. Provic [email protected] Igor Savenkov (RU) ASA “Balcon Regis” et al. 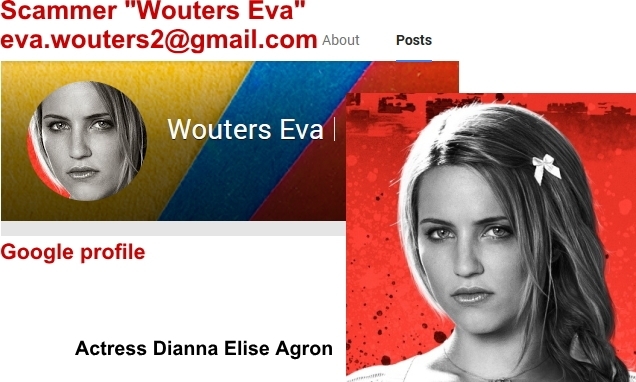 Rosy Bertrand [email protected] Alexander Schleber (BE) 6th impersonation! 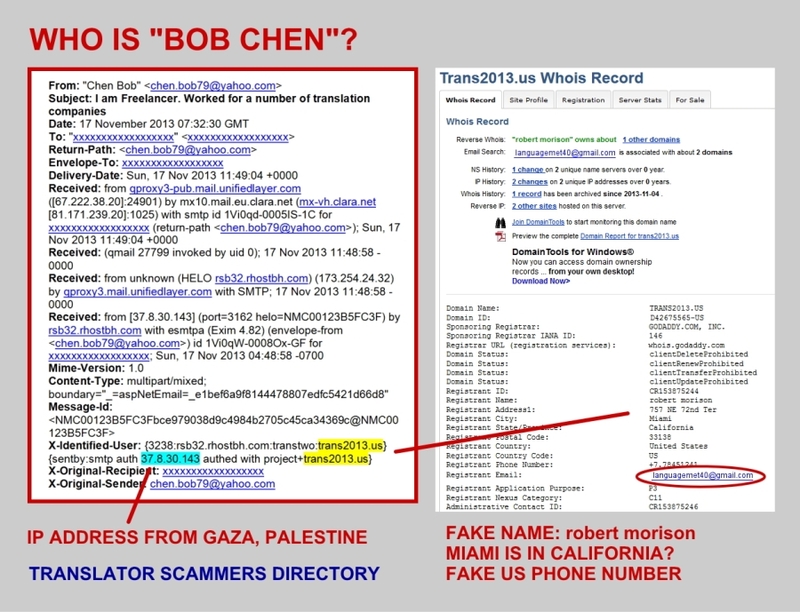 Saskia Kono [email protected] Alexander Schleber (BE) 7th impersonation! 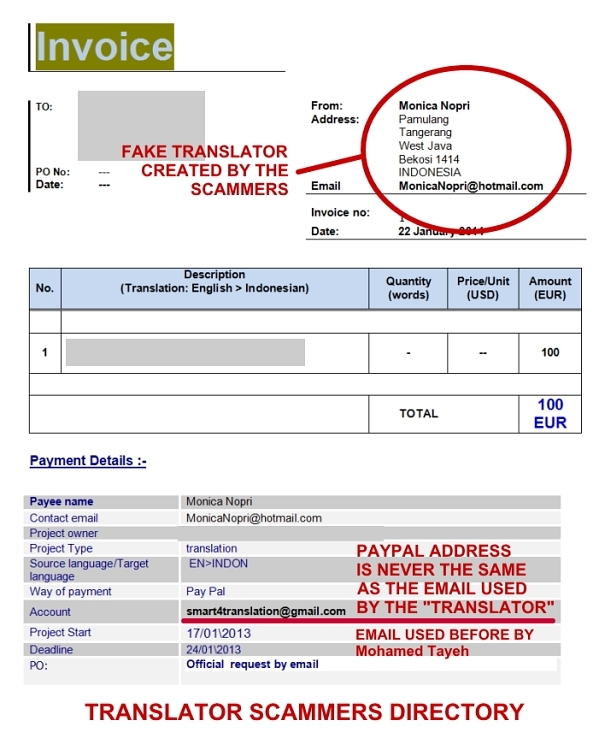 Somya Translators / Ajoy Singh [email protected] Impersonators of Somya Translators Pvt. Ltd.
Stefan Lovato [email protected] Ghost ID created by scammers. Also PayPal ID. 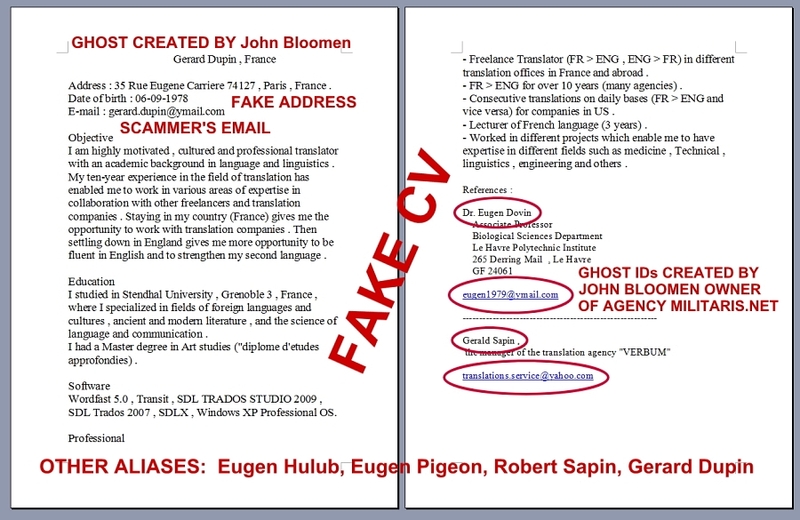 Yvonne Ehrlichmann [email protected] Ghost CV. Address: Insolvency firm??? 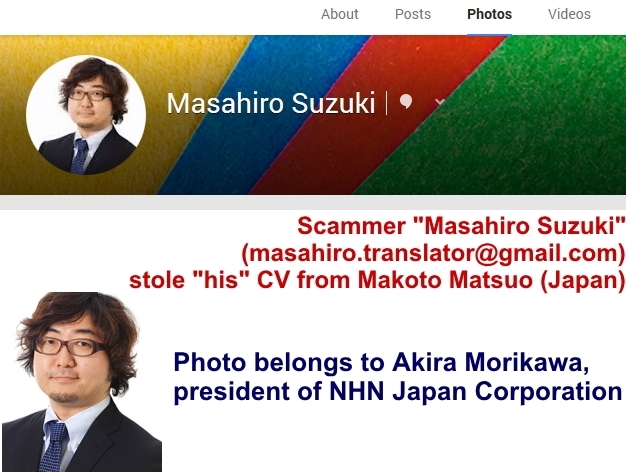 This entry was posted in Translation Tips and tagged application, fake, Fake translator applications, spam, spamming, translation industry, translations, translator on March 18, 2014 by madmin.